Announcement Welcome to N3 Pottery! Thanks for visiting my shop, and I hope you enjoy these hand-made items created in the Green Mountains of Vermont. Follow my Instagram feed for give-aways and sales throughout the year. Feel free to send me an e-mail if you are looking for something in particular. Happy Shopping! Welcome to N3 Pottery! Thanks for visiting my shop, and I hope you enjoy these hand-made items created in the Green Mountains of Vermont. Follow my Instagram feed for give-aways and sales throughout the year. Feel free to send me an e-mail if you are looking for something in particular. Happy Shopping! Perfect and beautiful. Thank you! Absolute perfection. Thank you! Can’t wait to get another. Really nice present for a skier. Nice ski mugs are pretty rare. Arrived quickly and intact. Yes please! Get ready for warmer weather with these tumblers! Zilla the helper dog doing his part in the shipping department- mainly because the biodegradable packing peanuts smell like Fritos. You may have met me at a New England craft show! I found my passion for ceramics through a circuitous route. With a background in biology and botany, I make my living as an ecologist, protecting natural resources in Vermont. I took a clay class in 2008 and have been hooked ever since. My affiliation with the natural world informs my artistic expression. N3 Pottery was born out of a desire to share that affiliation, and to pursue the seemingly endless array of creative possibilities that clay presents. I create sgraffito decorated pottery that is wheel thrown white clay bodies overlain with colored slip or underglaze. The work is characterized by bold, graphic designs using simple harmonious color schemes of slip and glaze. The result is functional handmade art that you can hold, feel and use. N3 Pottery also has a line of wall-art that uses compilations of ceramic plates/boxes to convey the landscapes of Vermont. I work out of my home studio in Moretown, Vermont. You may see me at a craft show in New England in the warmer months, when I can camp in my vintage fiberglass camper. In the winter, I'll be keeping the studio warm by running the kiln or on the slopes. I hope you enjoy what I have to offer. The work is constantly evolving, and my hope is to offer new pieces for a collector every year. Please note that the hand-made nature of this product may mean variations in glaze and design. These variations are what makes this work unique! If you're unhappy with your purchase, please inform me as soon as possible. If the only resolution is a return, you will be responsible for the safe return of the package within 14 days, and its return shipping cost. A full refund (minus our shipping cost) will be granted after we have received the pottery intact! Should your pottery arrive damaged or broken, I will try to find a suitable replacement as soon as possible. The replacement will be shipped at my cost, or I will issue a full refund. 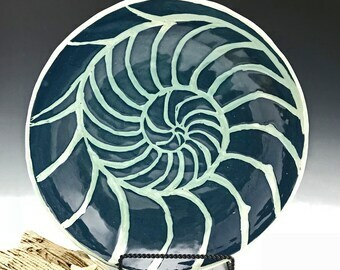 I'm new to this, so please provide feedback to n3pottery@outlook.com! I would love to hear what works and what could be better, and prefer a one-on-one interaction to the public forum.